Settling for less than average is a thing of the past with The Daley’s features. Each apartment home boasts detailed features from floor-to-ceiling and around every corner. Step into luxury living at The Daley. We think of the things you need that you don’t even know you do. Coming home to The Daley looks like setting your wallet, purse, bags or keys on the entry shelf, so you can use the easy keyless entry into your home. As you walk through the front door you are immediately greeted with wood-style flooring that is both practical and polished. When you need to catch up on your laundry, every unit has an in-unit, full size washer and dryer at your disposal. And, you can hang up all of your clean clothes in your spacious, walk-in closet. Select residences have vaulted ceilings and spacious balconies or patios. And our community is always smoke free, so you can breathe easy. Oh, and did we mention, we are pet friendly in all parts of our community. So, you and your pets, are both a big priority here. Relax in the bathroom you’ve always wanted. 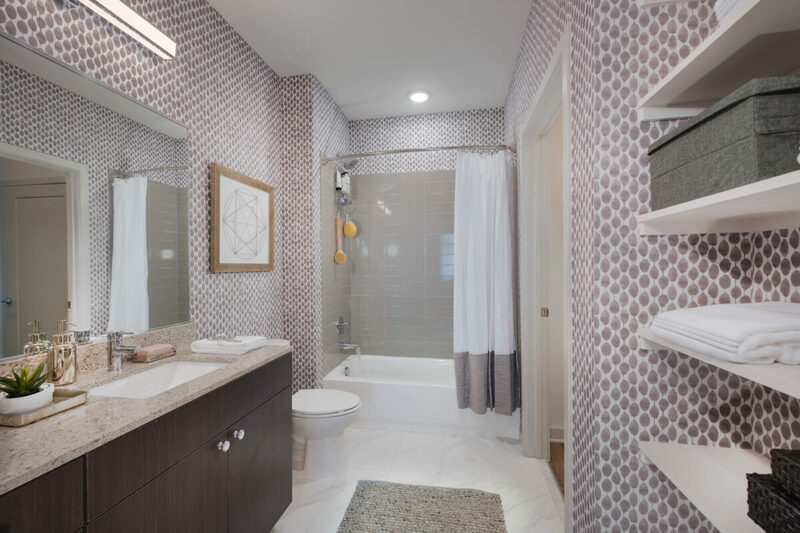 Our single and double vanities (in select units) are topped with Quartz, the shower is upgraded with a Delta rain shower head, and gray subway tile set off the whole room in the shower for a modern, clean design. Kitchens are for gathering, cooking, community & conversations over food. The Daley’s kitchens accomplish all of this and more with unparalleled style. Our practical and beautiful stainless steel appliances offset the glass tile backsplash that is shown off by the under cabinet and spotlight lighting. Have guests pull up a stool to the kitchen island or breakfast bar that is in some of our homes, while you chop up some veggies on the flawless quartz countertops. Everything in the kitchen is taken to the next level when you use your Delta fixtures, throw food waste down your in-sink disposal, and store all of your dry goods in your pantry (in select units). You deserve the best, and that’s exactly what The Daley’s features are. Schedule a tour of our homes today.